A Novel Dutch Lawsuit Demands Government Cut Carbon Emissions : Parallels An environmental group is behind the class-action suit that says the government is not doing enough to protect citizens. A ruling in the closely watched case is expected next month. 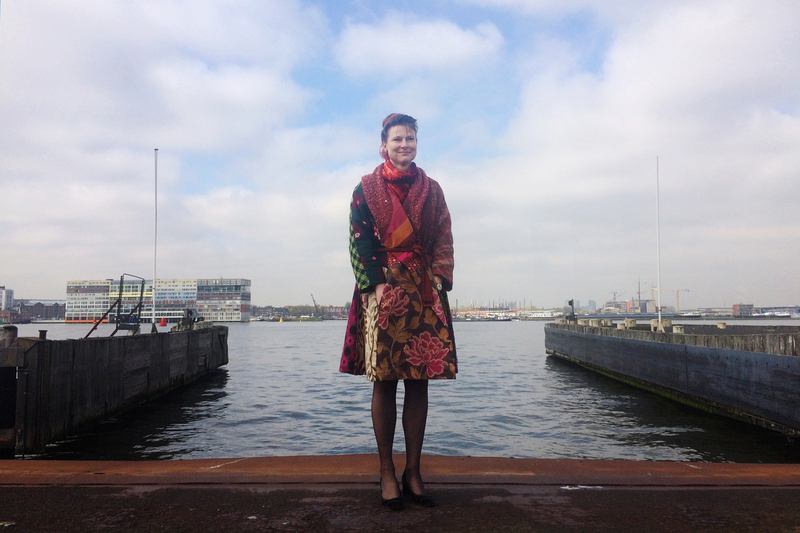 Marjam Minnesma, director and founder of the Dutch environmental group Urgenda, stands outside her offices at the harbor overlooking central Amsterdam. The group has filed a lawsuit against the government saying it has not done enough to protect citizens and must cut back more on carbon emissions. A lawsuit in the Netherlands is taking an unusual approach to climate change. So unusual, in fact, that experts around the world are watching it closely, wondering whether it might spark a major shift in environmentalists' efforts to limit carbon emissions. If that happens, it won't be the first time that Marjam Minnesma has turned the status quo on its head. She's founder and director of a Dutch environmental organization called Urgenda, an abbreviation for "urgent agenda." "Sometimes you have to do something, and then everybody's like, 'Oh, that's quite easy. Why don't we do that?' and then people follow," she says at her office in Amsterdam. For example, a few years ago the Dutch government told her that solar panels weren't feasible. Not enough people wanted them, she was told, and the price was far too high. So Minnesma started taking orders herself. She had a massive contact list from an earlier project, establishing the Dutch equivalent of Earth Day. People from that list started to sign up to buy solar panels, paying her 20 percent in advance. Once she had enough orders for 50,000 panels, she flew to China to negotiate with the manufacturers. They offered her a good bulk rate and said they would lower the price even more if she paid up front. "So we emailed all those people and said, 'Yeah, we did it, and it's going to happen! And if you want a little bit more discount, pay us two weeks before you get the solar panels.' And everyone did. So I had 20 million euros in a totally new bank account even before any solar panel arrived," she remembers, laughing. Her crazy-sounding plan has now become common. Today there are "hundreds of collective buying initiatives," she says. "So we really set a new standard." Minnesma could have remained in the bulk solar panel purchasing business. Or she could have changed her name and escaped with the 20 million euros to a distant tropical island. Much of the Netherlands is below sea level, including Amsterdam. Urgenda argues that any rise in the sea level could have a huge impact on the country. But she's more interested in successfully doing something that has never been done before, and then moving on. Today, she's working on another climate change moon shot. 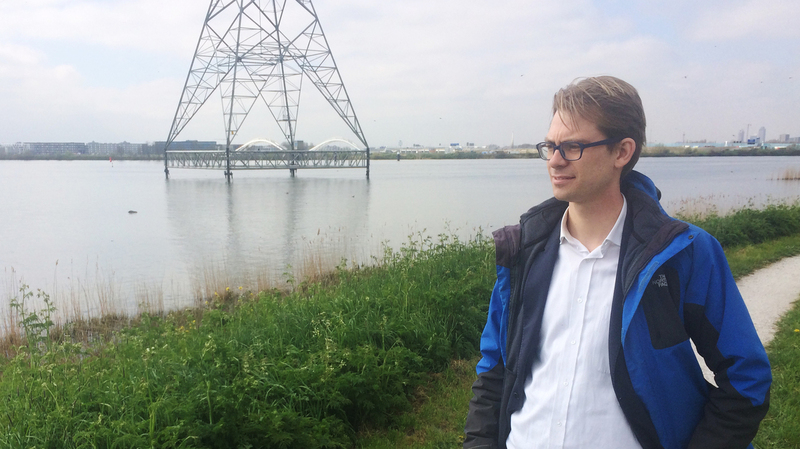 Her Urgenda colleague Dennis van Berkel takes me to the outskirts of Amsterdam to explain. We walk up a small hill. On the far side, there's a wide stretch of water where ducks and geese paddle in the shallows. Behind us, sheep graze in broad green fields. 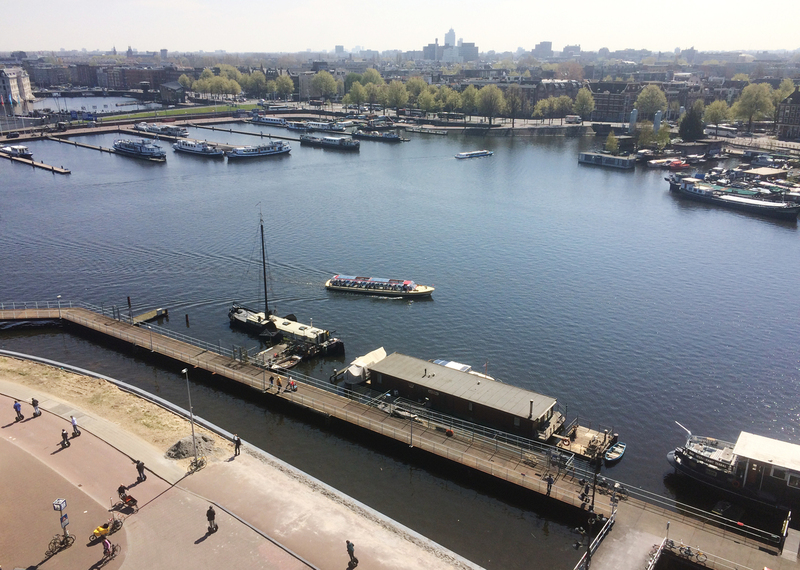 "The thing about the Netherlands is that, as you can see here, the water on our left side is higher than the land on our right side," says van Berkel. "We're about 3 meters below sea level here. What this place reminds me of is that for the Netherlands really in the long run, climate change is almost an existential issue." Van Berkel notes that the Dutch monarchy is 500 years old. 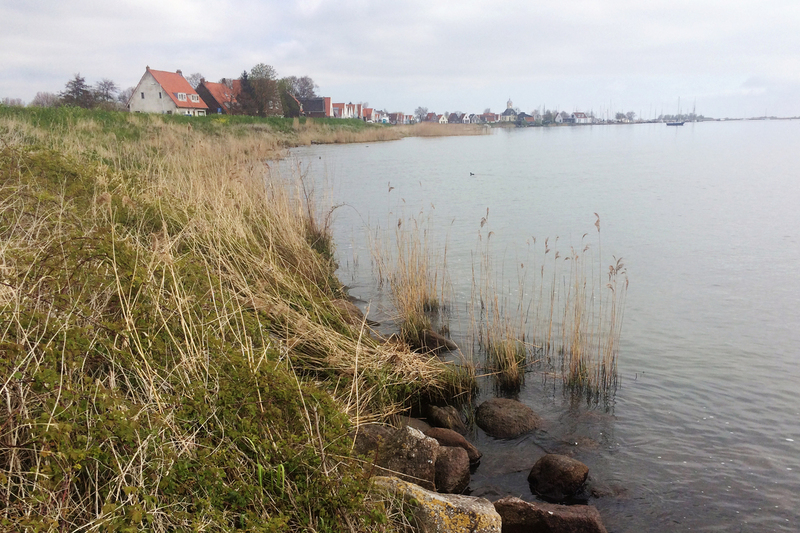 Given threatened sea level rise, he wonders whether the country will last another 500 years. The Netherlands is a land of levees and dikes that hold water at bay. The country has a reputation as a progressive place. But on carbon emissions, it's not progressive at all. Never mind the iconic windmills and bicycles — the Netherlands still relies heavily on coal-fired power plants. And the country's goals to cut emissions are far less ambitious than its European neighbors. That's why Urgenda filed a very unusual class action lawsuit. The case argues that the country is failing to protect Dutch citizens. The lawyers are asking a judge to order the government to cut the country's carbon emissions. Almost 900 people have joined the case, including an event planner named Natasja Vandinberg. "I'm the mother of an 8-year-old boy and an almost 4-year-old girl," Vandinberg says at a small cafe near her office. "And they are also plaintiffs." Dennis van Berkel, an attorney with Urgenda, stands on the outskirts of the city on an earthen berm. The level of the water is higher than the land on the other side of the berm. She explains that her children will be more affected by climate change than she will, since they will live longer. Vandinberg heats her house through solar power, she recycles, and she rides a bicycle. But she believes that individual action is not enough. "Even if I would do everything correct," she says, "the government buildings, the companies, the way we produce things in this country — I cannot change that by myself. We need the collective." The Dutch government declined my interview request. But in 2013, Environment Minister Wilma Mansveld told the Dutch newspaper Trouw that she thinks the lawsuit is "a good thing," since it may force the government to take politically difficult steps. That is not the official government position, and Mansveld has made few public comments about the case since then. The suit does have its critics. "I think you can probably find 900 people to join in frivolous nonsense in any country," says Tim Worstall of the Adam Smith Institute in London. The Netherlands' goals on cutting emissions are less ambitious than most of its European neighbors. Worstall is author of a book called Chasing Rainbows, How the Green Agenda Defeats Its Aims. He argues that it is inappropriate to blame the government for carbon emissions, because "it's the Dutch citizenry who actually use fossil fuels, and so it's the citizenry themselves who are causing the damage." There's another obvious shortcoming to this lawsuit. The Netherlands is a small country, and if it totally stopped emitting carbon tomorrow, climate change would continue at the same rate. I ask plaintiff Joos Ockels about this, sitting at her kitchen table in a row house overlooking one of Amsterdam's iconic canals. She's a grandmother, and she shared this home with her husband, the first Dutch astronaut, who died almost a year ago. Ockels explains that she became an environmentalist through him. Seeing the planet from space, she says: "You want to take care of Earth. And being married to a man like that, it influences you." Ockels admits that climate change is "a global problem. But I cannot handle a global problem. I can only handle my own. And if we make many, many, many people aware, well perhaps then I hope for a movement." Urgenda is working to get this approach to catch on, just as the solar panels did. From the beginning, lawyer van Berkel and others translated all of their documents and research from Dutch into English. They posted everything online. It was a huge and expensive effort specifically designed to encourage others to crib from Urgenda's work. Now lawyers in Belgium have filed a similar lawsuit. Lawyers from Australia and Canada have been in touch with the Dutch advocates. It has even caught the attention of American experts. "I think the people who are following climate change law are watching this case very carefully around the world," says Michael Gerrard, who directs the climate change law center at Columbia Law School. "If the Dutch court were to rule against the state in this case," he says, "that would be a very powerful signal that would probably then lead to similar litigation in many other countries." The court heard arguments at The Hague in mid-April. The judges say they will issue their ruling on June 24.